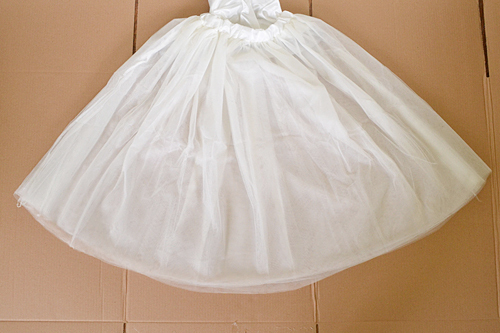 I have wanted a tulle skirt for quite some time. But I ran into a few issues... either they were too expensive or not the color I was looking for. 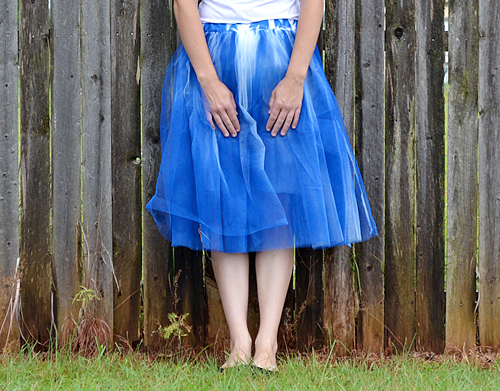 When Tulip Colorshot sprays came out I fell in love with the blue color and knew I wanted my very first tutu since I was in elementary school to be that very color! 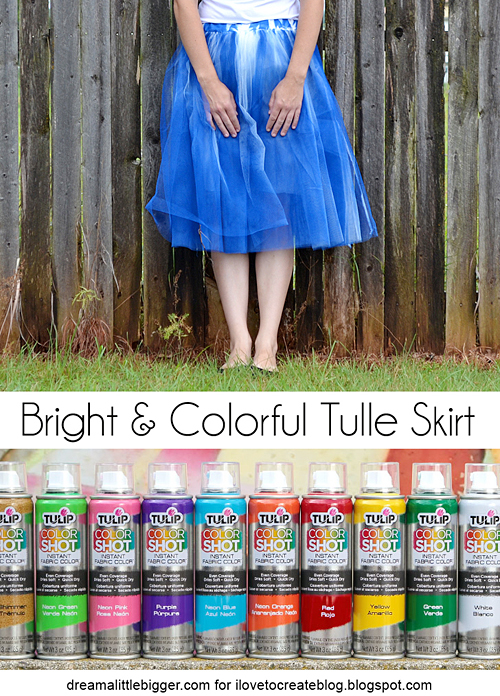 In the end my tulle skirt is pretty and colorful and just what I was hoping for! This is my skirt. 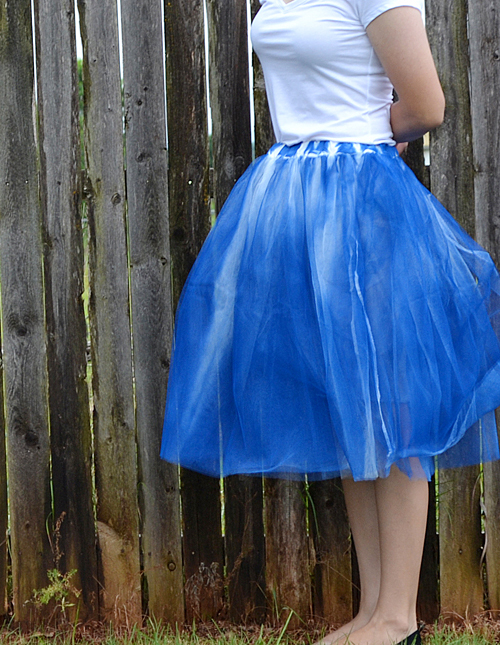 It was less than $12 with shipping on eBay (search for U.S. sellers only for 5 layer tulle skirt). Fair warning, it's free size which a version of one size fits all but it's normally meant for in Asian sizing. I wear a size 4 and it's comfortable but it could get snug pretty quickly for sizes beyond that. There are others that can be purchased that aren't quite as cheap but have better sizing options. 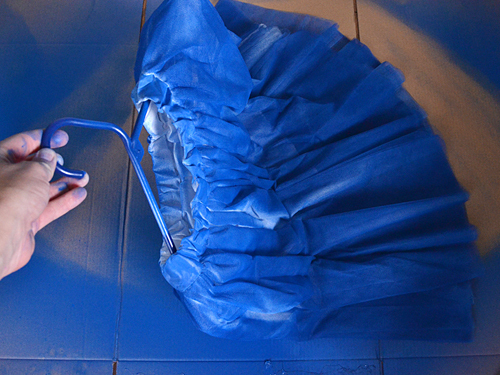 Protect your work area and get ready to spray your skirt. At first I thought I wanted my liner to remain white and pulled it up so I could cover it and not get any color on it but I soon changed my mind. You can spray whatever you please... leave the liner alone or spray it a different color for fun contrast, cover the entire skirt evenly or go for an ombre look. In my mind I wanted the look of clouds! Rather than smoothing my skirt perfectly out I left the pleats as is in spots to maintain the occasional bit of white! 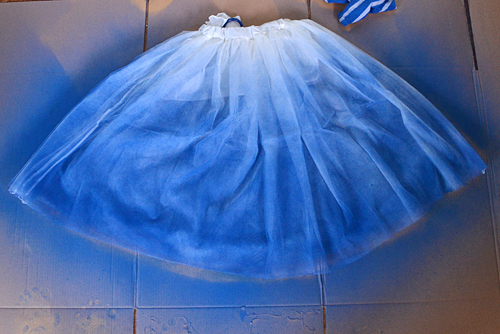 Spray one side of your skirt, turn and spray the other to match. 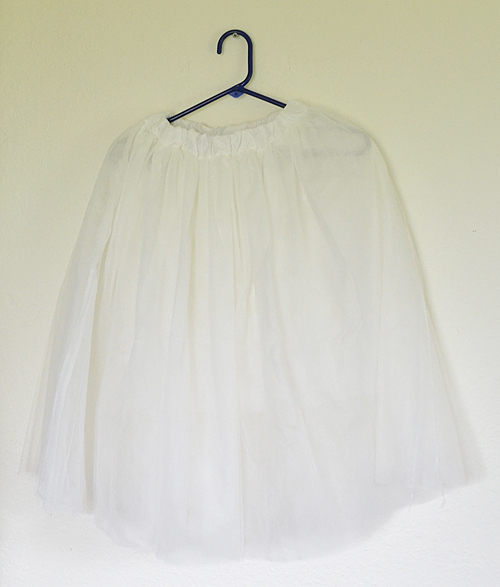 To get more white near the waist I held my skirt on a hanger and sprayed downward. The pleats in this area were tighter this way and kept more white that way. I liked spraying my skirt for a good couple of reasons... first my skirt wasn't as flowy but not poofy enough to be considered good and full. It looked like it was somewhere in between and I hated it. BUT after a bit of Colorshot my skirt has a bit more form and it lays just as I want it. It gets a bit crazy when the wind blows but I guess that is to be expected! :) Paired with a simple white tee and basic flats and the skirt is the star of the show and I feel quite lovely! I have a feeling you will feel feminine and fabulous too! If you loved this tutorial come and see me at Dream a Little Bigger! 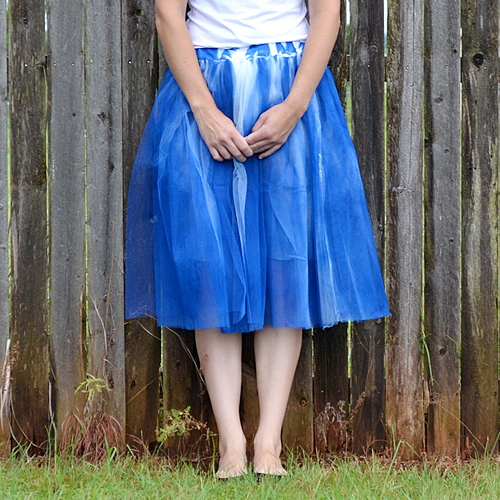 This skirt is awesome! I am glad to find your webpage. Hope to see more content here.